The upper slide rule is my father's; it was this that he used to first teach me how to use a slide rule. It has little index marks scribed on it that were constants he used in his work for calculating the weight of steel that would be in large cylindrical parts and so forth. The lower slide rule is the one I used in engineering school. My father actually bought it for me. On the right is a sheet of reactance paper, a special graph paper that facilitates graphical determination of the resonant frequency of an L-C circuit and such. It is Bell Telephone Laboratories issue. Doug what a nice still life. My father, an electronics engineer also taught me how to use a slide rule. But now I've forgot! In my days at school a slide rule was essential and there was the debate as to whether it was fair to exclude it from physics exams. Some thought it made us lazy, LOL. The paper I have never seen before. Log-Log paper was advanced as I got! In my days at school a slide rule was essential and there was the debate as to whether it was fair to exclude it from physics exams. Yes, teh same was a concern when I was in engineering school. When I was involved with a technical college (1973-1978), there was a debate as to whether hand calculators (typically the "four banger" type) should be allowed in class (for use in exercises, etc.) A related controversy was whether we should sell these in our bookstore, or whether a student with a scholarship should be allowed to spend any of it on a calculator. The paper I have never seen before. Log-Log paper was advanced as I got! Yes, it is specialized to electrical engineering, and many never encountered it. It has a basic log-log scale setup, the two axes being frequency and reactance. Superimposed on that were diagonal lines (on a logarithmic spacing) that correspond to values of inductance and (in the opposite direction) capacitance. If you wanted to know what reactance a certain capacitance would have at a certain frequency, you chose the capacitance line for that capacitance and then, from where it intersects the vertical line from the horizontal scale for the desired frequency, follow the horizontal line to the vertical scale and read the reactance. It was a very clever tool. I have two slide rules, from my late father. I never actually used a slide rule, when I started to learn about logarithms, the HP-35 was already a thing (although I never owned one). 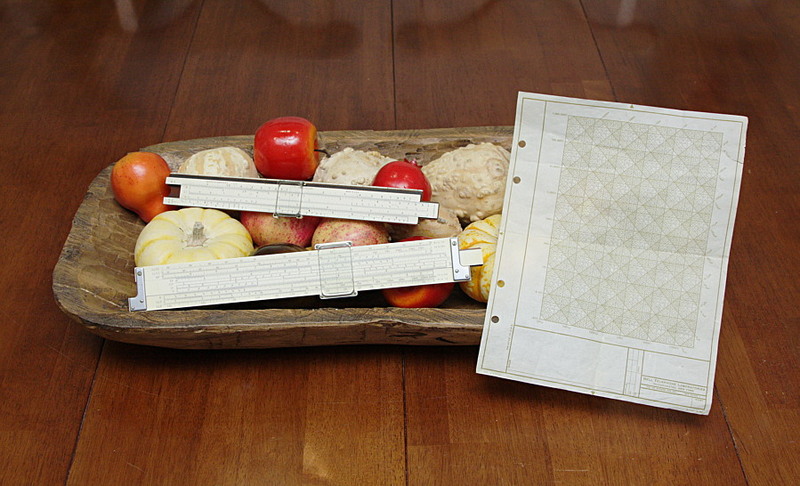 Now, if I am allowed to make a comment: why the fruits on what is a picture of slide rules and reactance paper? Because it is a custom of artists to have fruit as the subject of a still life. So this is sort of a joke. It is not captioned as a "picture of slide rules and reactance paper", but rather "with slide rules and reactance paper". Years ago when we were doing calcs and arguing digital vss film back in formative days, one of the engineers visiting from abq asked me if I had a calculator and I handed him my 1959 Post aluminum slide rule. He was not amused. Never used a slide rule in school, but learnt to use it anyway. I still have a slide rule, the disc variant of it and I still have my logarithmic tables. It was just the transition to widespread use of the electronic calculator in school for me (TI-30 to name one).